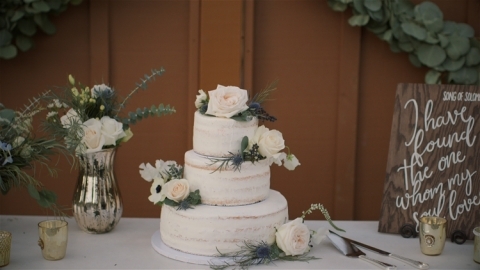 We had such a wonderful time at Erin and Jordan’s Bates Nut Farm Wedding! They started their day getting ready at Bates. Erin and her ladies enjoyed some champagne and goodies that Bates provided, like nuts of course! I loved her veil and the ribbons on her beautiful bouquet. The two had a lovely first look at a huge Oak Tree at the entrance of the property. They took some amazing photos and then joined the rest of their bridal party and family for more photos. Their decor was so whimsical and I loved all the lace and flowers. They got married under a beautiful archway with a pastor that Erin had known since childhood. He had so many great things to say about them and read such a lovely poem. 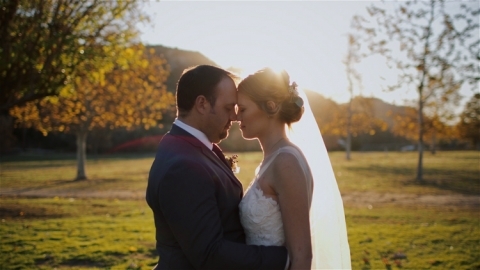 Erin and Jordan shared personal vows to each other and took communion together. It got a little windy and Erin almost lost her veil but it provided for some laughter to ease the nerves. After the ceremony they took some beautiful sunset photos while their guests enjoyed the beautiful January day! (Thank you San Diego!) Then the reception started with a fun grand entrance, first dance and a delicious Mexican food dinner. There was a lot more reception entertainment with the speeches and an adorable surprise dance by Erin’s sisters. With the photobooth and dancing, the guests all had so much fun! I just loved all the eucalyptus, the handwritten signs and the name card wall, so cute! And the twinkle lights during the dancing were just perfect. Erin’s shrug at the reception was also so cute as the evening grew chillier 🙂 We hope you enjoy this lovely lovely couple at their Bates Nut Farm Wedding! From the couple: Words cannot express how much Jordan and I absolutely love our video!